It took a base player to return vocals to their proper place on Duets — a record that's a model of simplicity. On the tracks on this LP you'll find Rob Wasserman's bass, and another voice. 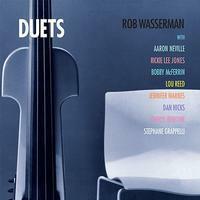 The result is a charming collection of duets featuring bassist Wasserman joined by special guests Aaron Neville, Rickie Lee Jones, Bobby McFerrin, Lou Reed, Jennifer Warnes, Dan Hicks, Cheryl Bentyne and Stephane Grappelli. The experimental release pairs the human voice with the bass guitar, resulting in a collection of unique and soulful material.